Brighton under-23 full-back Joe Tomlinson is loving his spell in non-league football at Bognor Regis Town. Tomlinson has made nine appearances for the Rocks this season, including emphatic 8-0 victories over Whitehawk and Burgess Hill Town, and the defender spoke positively about the experience so far. 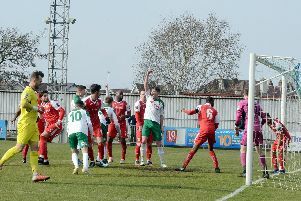 He told the Seagulls website: “It’s been brilliant at Bognor, it’s men’s football and it’s a different style of football. It’s great that I still get to train with Brighton every day and then go and play games for Bognor. “I’m learning so many different lessons in men’s football. The physicality is something to get used to, but I’m really enjoying it. It’s a brilliant balance at the moment. I’m training with great coaches and brilliant players at Brighton, which is helping me technically. The defender’s loan move has provided him with his first taste of non-league action, and it’s been a pleasant experience for Tomlinson. “Non-league is still a very good standard of football and it’s also enjoyable. It’s a great atmosphere and the games definitely aren’t boring. “The home support and travelling support at Bognor is always brilliant. They’re always cheering for you and I was very surprised with the amount of fans that do come to the games." Tomlinson is set to play his tenth Rocks game at home to Margate today.